The wait for voice calling on WhatsApp continues, but a few features of the upcoming service have leaked online. 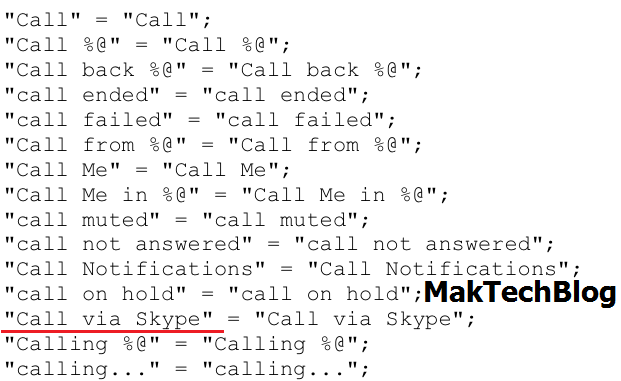 According to a report by Maktechblog, the November update of the app had a reference to "Call via Skype" feature. Besides this, there were several other features such as 'Call Hold', 'Call Mute', 'Call Back', 'Call Back Message', 'Call Me in X minutes', 'Call Notifications', and a separate screen for call logs. The report also mentions a 'Driving Mode' feature, which could either read out messages and calls while the user is driving or work as a 'Do Not Disturb' feature. WhatsApp, the popular instant messaging service has been working on voice call feature since last year. Back in February, WhatsApp has announced that it will be releasing Voice Calling feature in Q2 2014. But it never happened, Later Whatsapp CEO confirmed that the Voice calling feature is coming to WhatsApp in 2015. Voice calling will be very important feature for WhatsApp as many other IM apps are already offering this feature. For Voice Calling, Skype is believed to be biggest competitor for WhatsApp as Skype has been offering Voice and Video calls since many years. But it is looks like WhatsApp and Skype will act as friends than competitors. WhatsApp is working to integrate “Call via Skype” option in its Voice calling feature. Page created in 0.515 seconds with 36 queries.